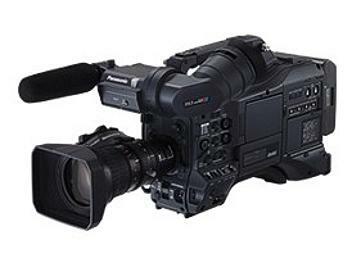 The Panasonic AG-HPX300 is an affordable professional camcorder with 10-bit, 4:2:2, individual frame recording and native 2.2 megapixel imagers. Incorporating an innovative, low profile shoulder mounted design, the 1/3" AG-HPX300 P2 HD camcorder offer the flexibility of interchangeable lenses but come standard with a 17x HD Fujinon lens. The AG-HPX300 imager incorporates advanced 1/3" 2.2-megapixel 3-MOS technology to acquire full native resolution HD images. With a redesigned optical block and a high-precision prism bonding technology, these advanced 3-MOS imagers provide exceptional image quality while minimising any flare and chromatic aberration. A new 20-bit digital signal processor (DSP) also enhances the AG-HPX300's image performance.